A group of scientists in the Institute of Stem Cell of the University of Science have been successful in making a drug made from stem cell for treating lumbar degenerative disc and knee osteoarthritis, the first of its kind in the country. On one hand, the drug not only helps to reduce pain for patients suffering lumbar degenerative disc and knee osteoarthritis but also lower the treatment cost compared to the traditional methods. On the other hand, it has shown a big progress of the country’s stem cell technology. Lumbar degenerative disc and knee osteoarthritis are popular diseases in the world especially in countries with aging population. According to Hanoi-based Bach Mai hospital’s statistics, around 10 percent of total patients in the infirmary are suffering the two diseases every year. Patients of the two diseases could be invalid even death without timely treatment. 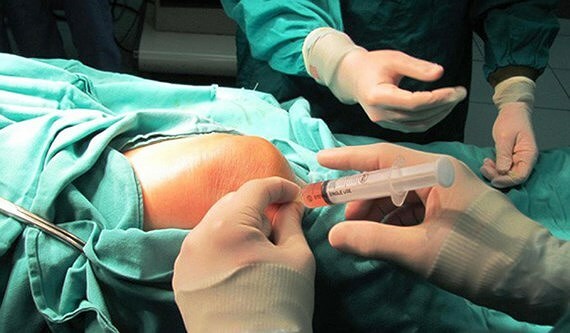 Traditional treatment is taking pain killer and Hyaluronic acid injection and joint replacement operation. However, the treatments have side effects such as increase in digestive bleeding risk, heart disease and bone fibrosis. Moreover, cost of a join replacement operation is VND80 million ($3,448) which is so high that many patients can’t afford resulting in a large number of invalid people because of lumbar degenerative disc and knee osteoarthritis. Invalid patients has preoccupied President of the Institute Associate Professor Pham Van Phuc and his research partners. The group of scientists started making research on drug with the aim of curing patients suffering the two diseases with lower fee, said Associate Professor Phuc. After four years of making experimental studies and analysis of data for drug production, scientist group started to check its quality in 2016. Associate Professor Phuc said the product is the third generic drugs on human. Presently, just few nations possess the technology of stem cell drug for treating the two diseases and just around ten stem cell products are sold in countries in the world. Clinical trials of the drug will be carried out next year, said Associate Professor Phuc. Now, Van Hanh General Hospital is entitled to use the drug in treating the two diseases. Initially, side effect of the new drug is less than the traditional methods. Sixty percent of patients in Van Hanh Hospital have been cured after taking the drug while 30.16 percent of patients said that their disease has shown sign of abating and 9.84 percent said that their diseases maintained unchanged.